PIQO Projector Review [Indiegogo] — Project Debunked! PIQO is a 2-inch cube that projects images and videos up to 240 inches. In this article, you will learn the insight of this product. And ulitmately, should you buy this? PIQO projector is able to project videos and images from any of your devices, boasting universal compatibility. It can stream from apps such as Netflix, Hulu, YouTube and more with a 200-lumen display. Theoretically, one wouldn’t have to fuss with focusing it, either, because it has Keystone adjustment with gravity sensors that adjust the projection angle automatically. It also has hi-fi speakers built into it that were designed by engineers from Bose, which is surprising because it’s small enough to fit in your pocket. It sounds like an awesome new toy, or a great way to make the most of business presentations, but there are several flaws and drawbacks that you may want to consider before backing it. On their story page, the company says that the PIQO can be used for 5 hours of video projection, or 50 hours of music. That’s about the average (or lesser) for other projectors of its kind on the market, like this one, despite slightly bigger in size. The device is powered by Android, which will help to make it compatible with a variety of apps. However, they’re using Android version 7.1, which releases two years ago. The company says that they use 7.1 because it optimizes the battery life. But, this means that because they’re using an older version, it may not be compatible with some apps, which has made many people question their claim of universal compatibility. The company makes a big deal out of advertising that their speakers are high-quality and produce great sound. But, the speakers are located at the bottom of the projector. This makes them easily obstructed. Even if they somehow manage not to be obstructed, the acoustics won’t be great if the sound is partially coming out of the bottom of the device. You also really can’t use a tripod that’s made by another company. It would obstruct the speakers. The speakers are either 3w or 5w. The company has stated that it was both and contradicted itself about the specifics several times in the comments. But, for the sake of this writing, it doesn’t really matter. Either way, they won’t be much different from other mini-speakers on the market that are mediocre at best. In order to project a 240-inch picture, you have to place the projector about 10 feet away from whatever you’re projecting your images or video onto. This is great if you’re outdoors or someplace large. If you live in a small apartment or loft, however, you may have trouble getting the PIQO far enough back, without obstructions or anything in front of it, to get the 240-inch image. The 200-lumen brightness isn’t very bright. You’ll likely have to view it in complete darkness just to be able to see the image or video you’re projecting. For comparison, other projectors use 2,000-3,000 lumens or more, and ANSI lumens are brighter, as well. This may be why it appears to project in 720p and not the 1080p that’s advertised. There’s some conflicting information about the focus on the PIQO, as well. It’s stated several places that there’s an automatic focus. However, the company has said several times that “focus is manual right now”. They go on to explain that there’s a manual adjustment wheel. So, not only is it likely to not be very bright, you may have to fiddle with it a lot to get it into focus. There have been a few fiascoes during this campaign that you should probably take note of. First, they advertised that the PIQO had both USB and HDMI inputs. It didn’t have an HDMI input at all, and they instead told backers to buy a USB to HDMI adapter. But, that’s rather a pain because they’re hard to find, they’re expensive and they cause a considerable amount of lag. After enough outcry from backers, they eventually decided to extend the campaign, rebuild their prototypes and include an HDMI input. What’s odd about this is that their reasoning for not doing this to begin with was that it would cost more money and it would push back their production and delivery dates. Now they’re saying that the product won’t cost backers more, and they’ll get their product on time. Then there’s the tripod fiasco. If you check out the story page of their campaign, every video and most of the pictures include a tripod. 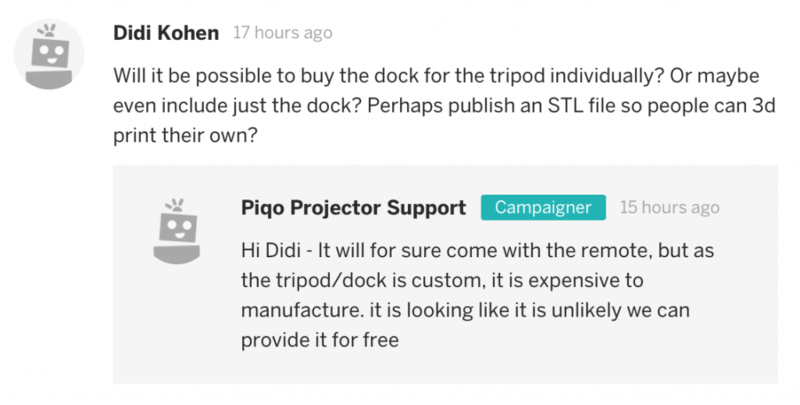 And, if you go through the comments, they quite frequently told backers that a tripod would be included with their PIQO. Now they’re saying that they’re going to include a remote, but not the tripod. 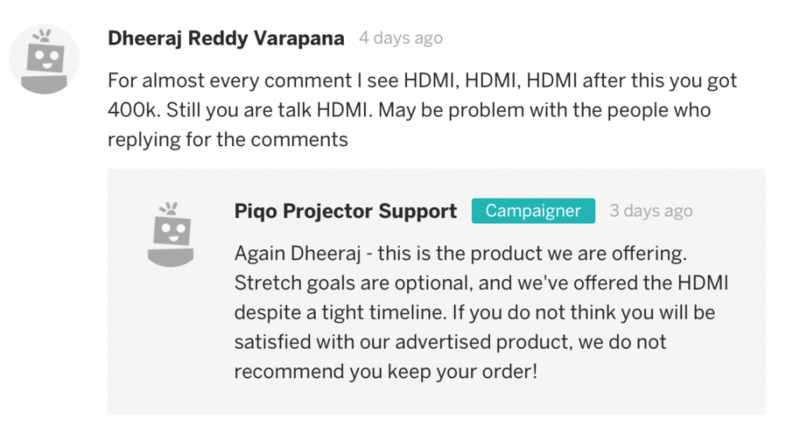 This is annoying, not only because they misled their backers, but because of the design of the PIQO. With speakers on the bottom of the device, using any other tripod will obstruct the sound and make the product massively ineffective. They’re considering adding the tripod on as an add-on after the campaign, but they’re not really making any guarantees about this. And when anyone complains, they tell backers that they should request a refund and maybe buy it after the campaign is over. This seems like a bad move on their part because lots of people seem to be doing just that because they’ve lost their trust in the company after so many discrepancies in the campaign. So, is it worth it to back the PIQO projector? The company willingly admits that in terms of video and sound quality, PIQO is pretty well the same as its competitors. The only factors that really set it apart are its size and weight, which make it more portable than other projectors. And, any company that tells you that if you have a problem, you should just get a refund and maybe try again later, instead of trying to fix the problem, is probably not worth backing. With loads of misquotes and discrepancies throughout the campaign, it will be interesting to see what the final product is and how backers feel about it once they receive their PIQOs. The pocket projector with 1080p!